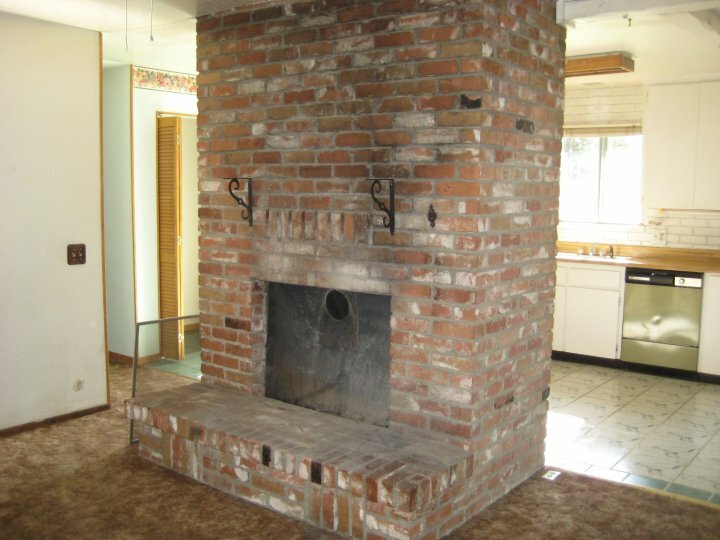 You all remember this monstrosity of a fireplace, right? Thought so! What I haven't showed you yet, is our new and improved fireplace (the one with the switch!). I thought I would show you the journey...since hubs and I worked on it. Sweet hubs making sure the tile fit! 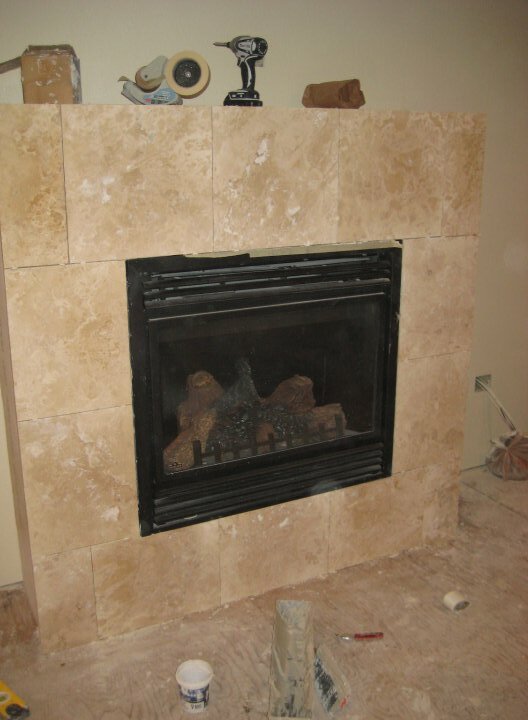 We "splurged" on the tile and got real travertine! I love how each piece is different and beautiful! I've never had a formal mantel before, so I've been having fun decorating! 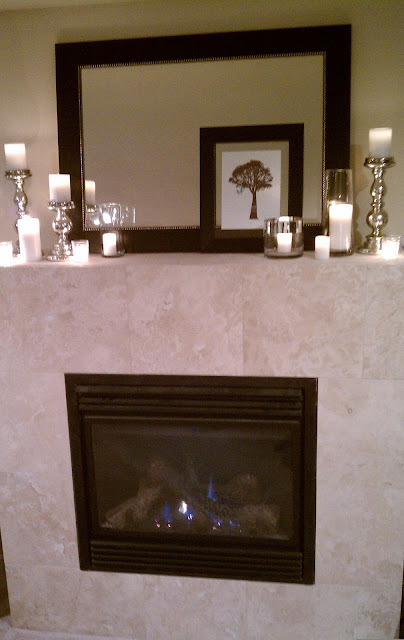 The mercury glass candle pillars and small glass candle holders are from Pier One. The others are random vases we had around the house. The mirror is from Lowe's. 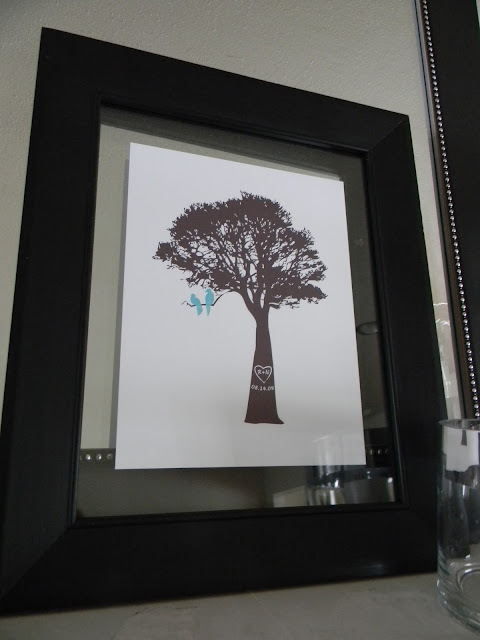 And the print was a Valentine's Gift for my hubby from Fancy Prints (originally inspired from Erinn's post here--see I told you I would get it!). The trunk has our initials and wedding date on it. I love how special it is...we'll have it forever! Oh and the frame is from here. Now the only question left is whether we actually buy a "real" mantel. I have some ideas...but I'd love to hear yours! WOW..speechless what an amazing job you guys did.. so you put up a wall as well? And carpet? I LOVE the look you have going on the mantel as it is and am contemplating stealing this "look" but modifying it for a large shelf love the sleek and classic look. Beautiful! I really like the simplicity of it and "sleek" is definitely the right word. I'd say purchase a mantel mainly so there is somewhere to hang Christmas stockings. Though, esthetically there is not much need for a mantel because it looks great without it! Before I even got to the bottom, I'm like "YOU GOT IT!"... 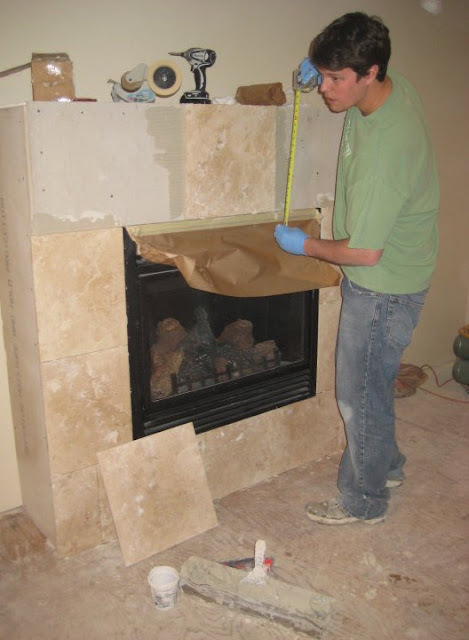 Love it looks great, and check out your tiling.... we have similar travertine in our bathroom, it is pretty. 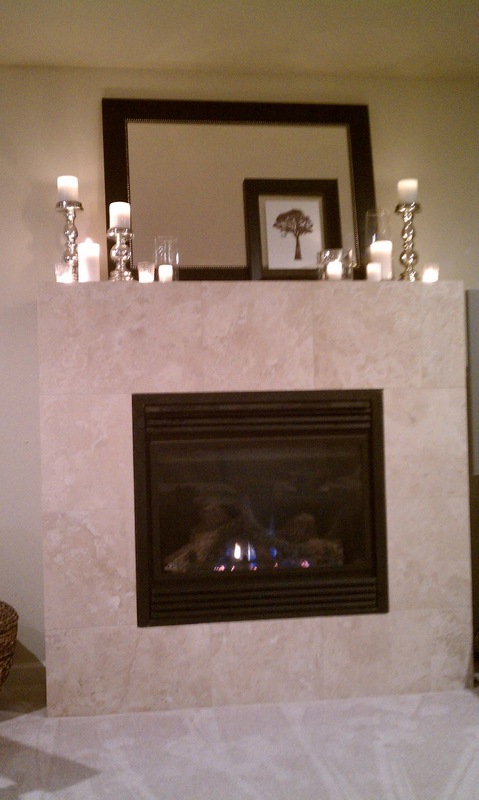 I wish we had a fireplace now.... silly townhome. I love doing projects with my husband. 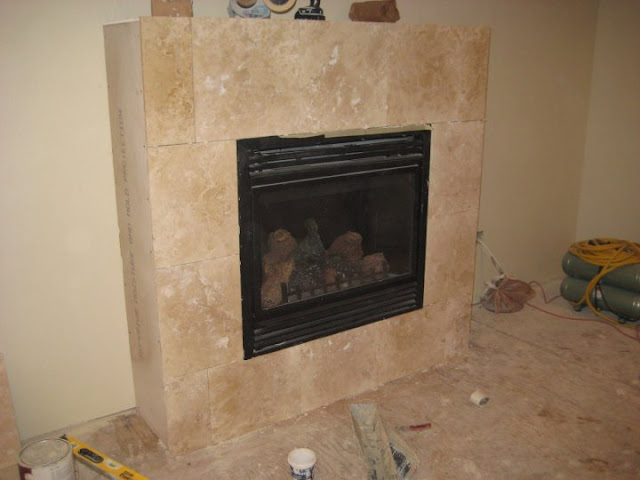 Your fireplace looks great! Just came across your blog, and I LOVE it. Tahoe? I have family there! Gorgeous! Wowww! You all did an amazing job! 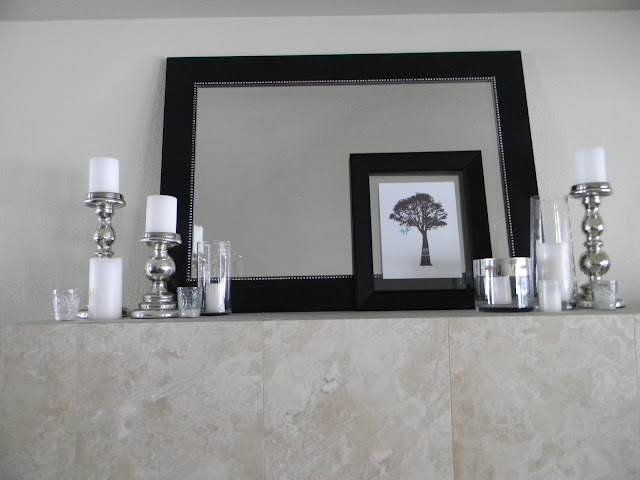 Love how you arranged the mantle, too. Oh my gosh!! It's stunning, girl! Such an improvement (: Love your mantel, too. The candles are pretty! Beautiful!! 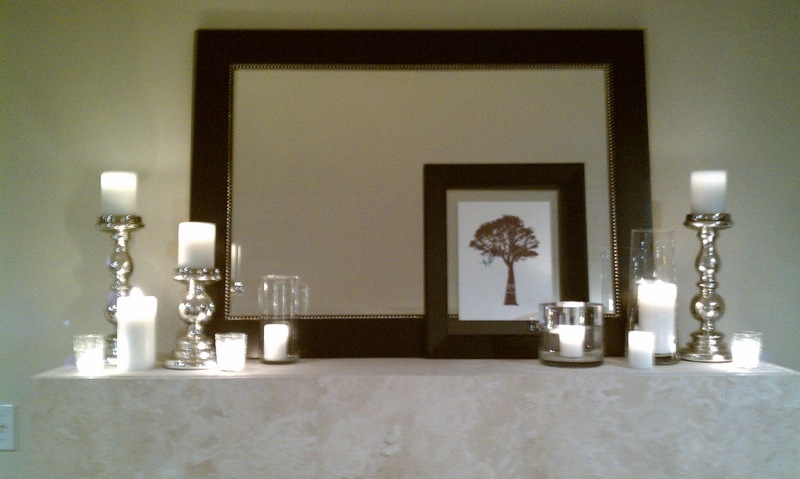 I love how elegant it looks with the candles and glass frame. That print is so sweet! Awesome job on the tiling!! I love the tree print! My one year wedding anniversary is coming up and I have been looking for something to do with the whole paper theme...this would be perfect!